U.S. Coast Guard and Maritime Law Association attorneys coordinate training to promote pro bono representation of mariners at Coast Guard suspension and revocation hearings. 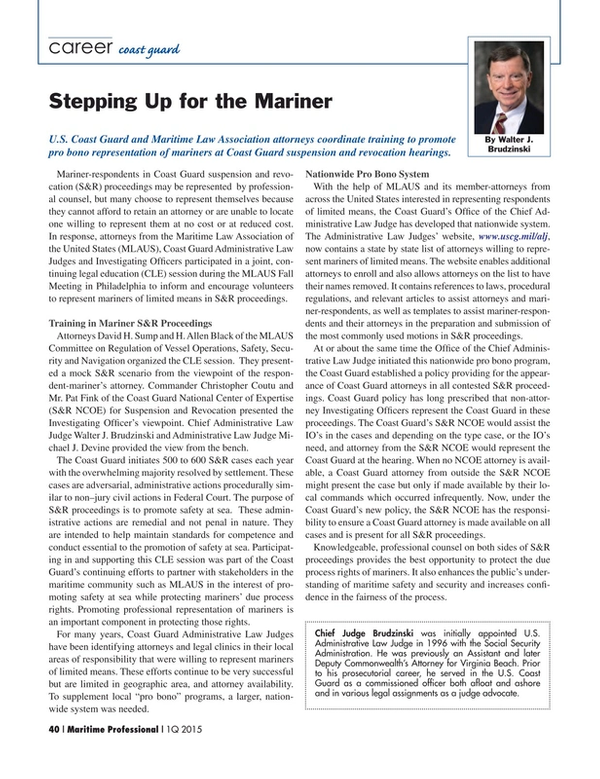 Mariner-respondents in Coast Guard suspension and revocation (S&R) proceedings may be represented by professional counsel, but many choose to represent themselves because they cannot afford to retain an attorney or are unable to locate one willing to represent them at no cost or at reduced cost. In response, attorneys from the Maritime Law Association of the United States (MLAUS), Coast Guard Administrative Law Judges and Investigating Officers participated in a joint, continuing legal education (CLE) session during the MLAUS Fall Meeting in Philadelphia to inform and encourage volunteers to represent mariners of limited means in S&R proceedings. Attorneys David H. Sump and H. Allen Black of the MLAUS Committee on Regulation of Vessel Operations, Safety, Security and Navigation organized the CLE session. They presented a mock S&R scenario from the viewpoint of the respondent-mariner’s attorney. Commander Christopher Coutu and Mr. Pat Fink of the Coast Guard National Center of Expertise (S&R NCOE) for Suspension and Revocation presented the Investigating Officer’s viewpoint. Chief Administrative Law Judge Walter J. Brudzinski and Administrative Law Judge Michael J. Devine provided the view from the bench. The Coast Guard initiates 500 to 600 S&R cases each year with the overwhelming majority resolved by settlement. These cases are adversarial, administrative actions procedurally similar to non–jury civil actions in Federal Court. The purpose of S&R proceedings is to promote safety at sea. These administrative actions are remedial and not penal in nature. They are intended to help maintain standards for competence and conduct essential to the promotion of safety at sea. Participating in and supporting this CLE session was part of the Coast Guard’s continuing efforts to partner with stakeholders in the maritime community such as MLAUS in the interest of promoting safety at sea while protecting mariners’ due process rights. Promoting professional representation of mariners is an important component in protecting those rights. For many years, Coast Guard Administrative Law Judges have been identifying attorneys and legal clinics in their local areas of responsibility that were willing to represent mariners of limited means. These efforts continue to be very successful but are limited in geographic area, and attorney availability. To supplement local “pro bono” programs, a larger, nationwide system was needed. With the help of MLAUS and its member-attorneys from across the United States interested in representing respondents of limited means, the Coast Guard’s Office of the Chief Administrative Law Judge has developed that nationwide system. The Administrative Law Judges’ website, www.uscg.mil/alj, now contains a state by state list of attorneys willing to represent mariners of limited means. The website enables additional attorneys to enroll and also allows attorneys on the list to have their names removed. It contains references to laws, procedural regulations, and relevant articles to assist attorneys and mariner-respondents, as well as templates to assist mariner-respondents and their attorneys in the preparation and submission of the most commonly used motions in S&R proceedings. At or about the same time the Office of the Chief Administrative Law Judge initiated this nationwide pro bono program, the Coast Guard established a policy providing for the appearance of Coast Guard attorneys in all contested S&R proceedings. Coast Guard policy has long prescribed that non-attorney Investigating Officers represent the Coast Guard in these proceedings. The Coast Guard’s S&R NCOE would assist the IO’s in the cases and depending on the type case, or the IO’s need, and attorney from the S&R NCOE would represent the Coast Guard at the hearing. When no NCOE attorney is available, a Coast Guard attorney from outside the S&R NCOE might present the case but only if made available by their local commands which occurred infrequently. Now, under the Coast Guard’s new policy, the S&R NCOE has the responsibility to ensure a Coast Guard attorney is made available on all cases and is present for all S&R proceedings. Knowledgeable, professional counsel on both sides of S&R proceedings provides the best opportunity to protect the due process rights of mariners. It also enhances the public’s understanding of maritime safety and security and increases confidence in the fairness of the process. Chief Judge Brudzinski was initially appointed U.S. Administrative Law Judge in 1996 with the Social Security Administration. He was previously an Assistant and later Deputy Commonwealth’s Attorney for Virginia Beach. Prior to his prosecutorial career, he served in the U.S. Coast Guard as a commissioned officer both afloat and ashore and in various legal assignments as a judge advocate.